Based on New 52, Medicom unveils another release in their DC Comics Real Action Hero line of 1:6 scale figures. 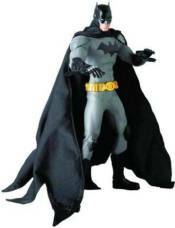 The Batman New 52 Real Action Hero 1:6 Scale Figure is sculpted from original designs by Jim Lee and built using the finest craftsmanship and costume tailoring. Enjoy this interpretation of the Dark Knight as a 12-tall figure with an impressive costume!